Castleton alum Edward Wilkin enjoyed his first experience at Castleton so much that he came back to do it again. 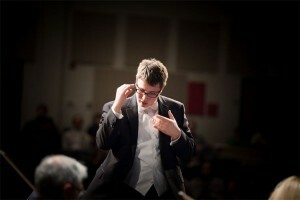 Originally from Cresskill, New Jersey, Wilkin graduated with his Bachelor of Music in Music Education in 2012 before continuing his education at The University of Rhode Island, where he completed a Master of Music in Choral and Orchestral Conducting. He came back to Castleton to earn his second Master’s Degree in Music Education, which he completed in 2017. Wilkin is currently teaching at neighboring Fair Haven Union High School. He is active in the local community and has served as interim choir director at Grace Congregational Church in Rutland, started a community chorus in the Fair Haven region called Slate Valley Singers, and is also directing the Lakes Region Youth Orchestra. Through all of his new experiences, Wilkin is very grateful for the opportunities Castleton University has given him and the people who made them happen. He remained in touch with Sherrill Blodget, Charles Madsen, Glenn Giles, and Kent Baker, even during his time at URI. “They always pushed me forward in good ways. They were and are tough, but they gave me a further dream,” Wilkin said. Wilkin comes from an untraditional family and was the first to receive a master’s degree – let alone two – in the family. None of it would have been made possible without the support he received while at Castleton. “Castleton laid the foundation for me to leap forward fearlessly, achieve my high goals, and dreams,” he said.